One of the most abiding moments of UbuntuNet-Connect 2015 week in Maputo, Mozambique, was the sight of Somali Research and Education Network (SomaliREN) CEO Dahir Hassan Abdi sitting in a conference room next to UbuntuNet Alliance CEO Dr. Pascal Hoba. It was on Wednesday, November 18th 2015, 16:00hrs local time. 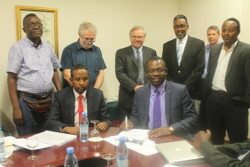 The two were signing SomaliREN’s €280,000 AfricaConnect2 Advance Payment Agreement for connectivity of the NREN to the UbuntuNet network. The NREN’s connectivity to the UbuntuNet network comes under the $16.6 Million Somalia ICT Sector support programme being funded by the European Union, the Swedish International Development Cooperation Agency (Sida), the UK Department for International Development (DfID) and the World Bank. As a component of this wider programme, the World Bank is working with SomaliREN in a $3.5 million project aimed at providing connectivity to the country’s higher education sector. It is under this project that the €280,000 has been made available for SomaliREN’s contribution to AfricaConnect2. Among those present in the conference room to witness the signing of the SomaliREN and UbuntuNet Alliance connectivity pact were World Bank Lead ICT Policy Specialist Dr Tim Kelly and his counterpart Rachel Firestone. Commenting on the Bank’s support to SomaliREN, Dr. Kelly said connecting SomaliREN to the UbuntuNet network can help in facilitating stability in the troubled country saying the connectivity can help in training the country’s next generation of leaders as well as exposing the country’s youths to the wider world. SomaliREN CEO Dahir Hassan Abdi said the NREN’s connection to the UbuntuNet network will reposition SomaliREN as a fully functioning NREN adding this will also bring down bandwidth charges which he said are currently as high as $500 per Mbps per month. Abdi expressed gratitude to the development partners for the connectivity grant and appealed to Somali authorities to grant the NREN ample land on which to build a Network Operating Center where network engineers would be trained. The World Bank is expected to support the building of the Network Operating Center as well as in the setting up of Somali’s Communications Act. SomaliREN was established in 2006 with 7 member institutions but the NREN now has 14 member institutions.